I have designed my layout so that there will be three power districts, broadly front, middle and rear. Between the front and middle there will be a triangle allowing access to the yard down the middle from the front section and and the rear section. I propose creating the break between power districts at one corner of the triangle. can i still wire up one side of the triangle, that track between the front and the middle where the reversing polarity will occur, with the auto reverse panel (a Digitrax AR1)? Or should I make the power district division outside the toe end of the turnout that starts the triangle? Many thanks for any advices. Can you post a sketch? I'm not really sure of the track plan from the description. The main requirement for reliable reversing sections is that the longest train will fit in the section, or else metal wheels, helper locos or lit cars are likely to bridge the rear of the section while the headend bridges the front. On a wye with a deadend tail track that track is normally reversed. Not sure if this will work. 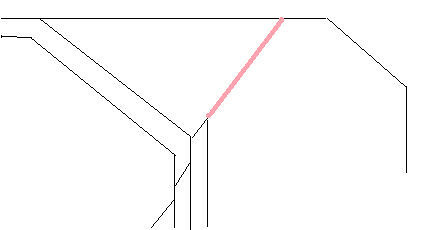 In the image the side of the triangle in pink is the reversible one. However it is not so long that an entire train will fit into it - it's a triangle or wye, a running line but I can ensure that all power will fit into it. Where should the isolation of both rails be sited - at the heel or toe end of the turnouts, at the one at top right as that will also be the location of power district boundary. Edited: Tried again to post image. Last edited by tunnelmotor on Fri Apr 04, 2014 9:23 am, edited 5 times in total. What happens on the ends of each leg you show? It looks a bit like the left and middle legs form a loop and the right is a stub end. If that is the case I would make the whole stub end the reversing section. That's what we do at Seaboard Southern. Actually that was the original intention until someone put the main power feed on the stub end. So now we have the whole loop as the reversing section. It works very well. I'm not so sure how that would translate to different power districts but I expect it would be OK. Why don't you come up to Seaboard Southern and we can show you how it works? If you pick a night when John Pitty is there I'm sure he would sort you out. There are no stub ends - it is all part of a continuous loop. The triangle pointing down the middle is the start of a yard to the left (a ladder starts where the turnout comes out to the left as you look at it) and a main and siding (the right two tracks) that meets the right hand track, in the same direction, at the other other end. The left hand top tracks go anti-clockwise down the room to meet the other two coming the other way. The polarity of the feeds on the pink section will be in conflict with one or other end of the abutting tracks. Picking up Mike R's point about length of train in the reversible section I guess the solution to that is to extend the reversible section down the right hand two tracks to their end where they come together to complete the lay-by siding, with the yard still physically independent to their left (on the sketch). The issue of principle remains, can I have a reversible section that at one end is the end of a power district? Last edited by tunnelmotor on Fri Apr 04, 2014 9:59 am, edited 2 times in total. I can't access your 2nd image or read the format of the first one. I suspect that having a different power district will work, after all if a district is reversed you still get a short circuit. If your system has a common between districts that would make it better. Hi Keith, under DCC, there's different methods of doing such a thing automatically. One technique I read about once to get over metal wheels causing a short at both ends when the train is longer than the reversing section was to have a small dead section, only a few millimetres or a truck length long to avoid the short. Not so long that an engine could die on it, but it assumes that it would pick up power from the other truck while it was crossing that section. If your axles are isolated from each other by the truck it could be smaller. Then it's just the locos you have to worry about when there's a helper half way down the train, and you would have to arrange them so that you don't get a situation where both locos are straddling the ends of the reversing section at the same time. Or those nice lit Athearn cabooses or passenger stock or sound equipped reefers etc. In the future we may have uncoupling decoders in all stock, so it is best to allow for all stock possibly having pickups.